Why do some trades list multiple price targets? Home » FAQs » Why do some trades list multiple price targets? Many of the trade ideas on RSOTC list multiple price targets to accommodate various trading styles. 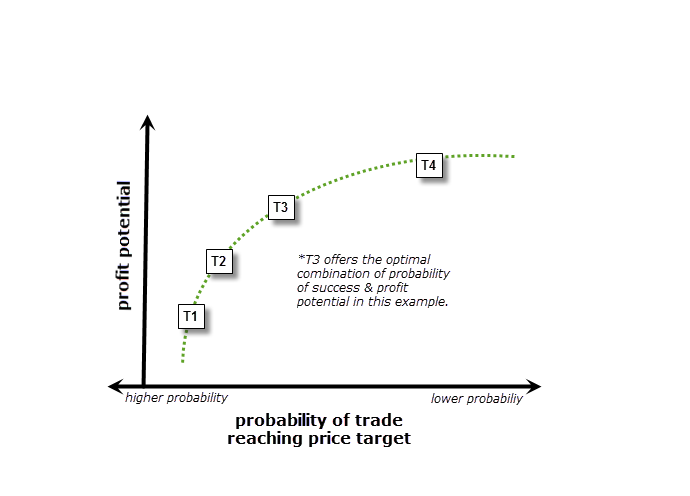 For example, a very active trader might only target T1 (the first profit target) looking to book a quick, relatively modest 5% on a trade that is expected to last anywhere from a couple of days to less than two weeks while a typical swing trader who is bullish on both the specific stock as well as the broad market in the short & intermediate-term might prefer to hold out for T3 for double-digit gains and an expected holding period of a few weeks to a couple of months, possibly booking partial profits or even reversing the trade (short to long for a quick bounce) at T2. Typically, the final target is set at a level in which the R/R is no longer clearly favorable to remain in the trade and therefore I will usually book profits on any and all shares that I might still own. A preferred target, which is often mentioned on a trade, is the level where the current “sweet spot” on the R/R curve is at the time, as illustrated in this example (chart). Multiple price targets are often used for the trade ideas to accommodate various trading styles. For example, very active traders who prefer to book relatively shallow, quick profits & move on to the next trade my decide to book full profits at the first target while typical swing traders with holding periods measured in weeks or months may target one or more of the higher targets, possibly booking partial profits along the way as the early targets are hit. Whatever your individual trading style is, the important thing is to have a trading plan in place for each trade which includes: How much capital you want to commit to the position; Whether you plan to scale into the position (average in) or take a full position upon your entry trigger; What your entry trigger will be; Your profit target(s) if the trade is successful as well as your stop level(s), if the trade does not pan out. also see: How Are Price Targets Determined?